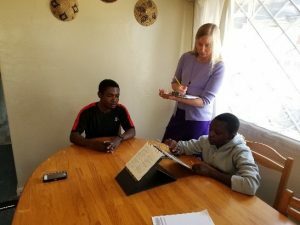 Julie Bohn reflects on her time in Zambia working with the Nephews. My husband Steve got to know Bill and Marci Hoover when he was a Christian World Outreach (CWO) board member for six years. Ever since Marci found out I assess children’s learning needs, she has wanted me to come assess the Nephews. They started working with a new group of Nephews in January of 2018 so this seemed like the perfect year to go. The Lord provided the funds. Steve was able to come for the first week. 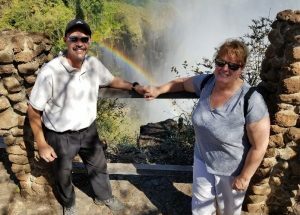 According to Marci, Steve and I provided her and Bill with a much-needed break from the day-to-day work and stress when we took them on a mini-vacation to Livingstone to go on safaris and see Victoria Falls. 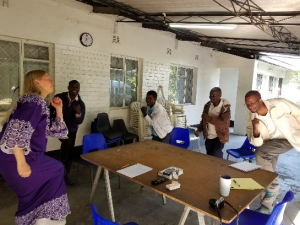 It gave them the opportunity to interact with someone from their home culture, which was refreshing and renewing; and allowed them to share their adoptive culture and family, which in turn renewed their joy and purpose in being in Zambia. We clicked with them as a couple right away. They would be people we would hang out with if they lived here. We had a blast together seeing the sights, laughing, and thanking the Lord for a very special time together. I trained the staff with effective teaching skills. Here I am showing them how to lead the boys in cross body brain exercises to warm up the Nephew’s brains for learning prior to lessons. They are using the exercises with the boys. I found the boys could read the English words but they did not know what they meant so I trained the staff in vocabulary development and how to develop comprehension questions for any reading passage. They have developed comprehension questions for this reading lesson. 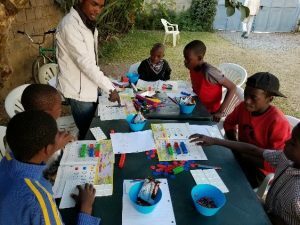 We were able to bring over many teaching supplies including handwriting workbooks, magnetic letters, and math manipulatives and train the staff in how to use them. As a result, the staff was able to add a day of math lessons to their weekly schedule of growth opportunities. These activities encouraged them and expanded the work they are already doing. I did learning assessments with the Nephews that helped the staff know the learning style and educational level of each young man, which, in turn, will help him learn more easily. The Nephews felt extremely important and of value to have someone work with them one-on-one, even if it was for testing! Two boys had ear issues diagnosed and treated that would have been overlooked. 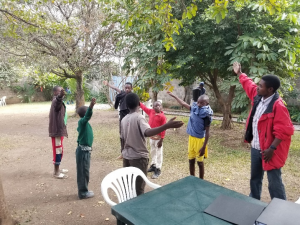 The parents felt truly grateful to have someone care this much about their sons and it connected them to CWO in Zambia on a deeper level than they had been in the past. The staff believes it caused the parents to take their son’s schooling more seriously. 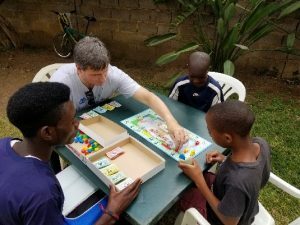 Steve’s time playing board games with the boys spoke so much love to them and helped them practice their English and counting skills. 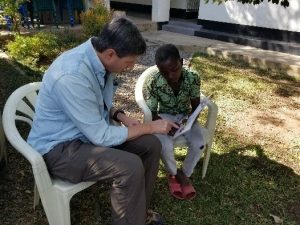 Steve’s time allowing them to read to him was also immeasurable – to have a MAN spend time with them teaches them that it is ok for men and fathers to interact with their children and to help boys read English. 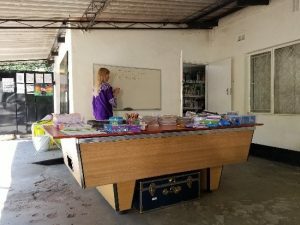 The Lord provided the funds – some personal for the four-day trip for the four of us and the teaching supplies, some from donors – for the airfare to get to Zambia and back. The Lord provided the giftings – teaching for me and giving for my husband. We just followed Bill and Marci’s example of Deuteronomy 5:32, “So you shall observe to do just as the Lord your God has commanded you; you shall not turn aside to the right or to the left.” Bill and Marci have lived out this verse in the development of the ministry to the Nephews. Each step of the way they have sought the Lord and obeyed what He revealed to them. It was a joy and a blessing to spend time with them and their staff. It was very hard to leave the Nephews. We remain in contact with Bill and Marci and the staff. We would love to see the impact of this trip continue and want to offer you an opportunity to be a part of it. In order for the lessons that the CWO Zambia team provides for the Nephews to have the greatest impact, the Nephews have to be in school. 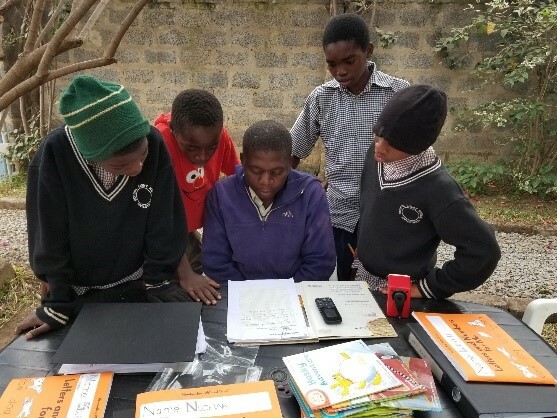 Each boy needs $150 to cover tuition fees, uniform, and all supplies. Our prayer is for each family to provide some amount towards the need, but it is typically very little due to their income being $2 per day. Would you consider helping one boy stay in school? Click on the Donate button above and select Zambia, and then select Scholarships and School Fees. Thank you!